If you need the room and versatility of a compact SUV, but you want something that is fun and sporty to drive, the 2012 Kia Sportage tops a very short list. Its affordable price makes up for its middle-of-the-road resale values, and its available 260-horsepower turbocharged engine is a rarity in this segment. Light weight but goes through heavy winter storms and not getting stuck. The Kia Sportage is very reliable in terms of it being all wheel drive. I have only had one major problem with the sensors in the back notifying me when I reverse. There are times when it alerts me that I am about to hit something but in reality, I am not. We have gone to get it fixed, but the problem keeps reappearing. Other than that, the Kia Sportage is comfortable because of the size of the SUV. It works well throughout winter storms and has great gas mileage. 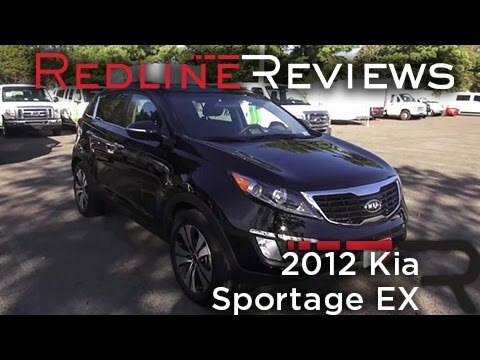 Overall, I recommend Kia Sportage to families or even college students who drive a lot and need to save money on gas. Great car but had one big issue. During a visit to san Diego my motor gave out. I heard an awful noise coming from the car. I had to get it towed all the way back to Los Angeles. I took it to Kia the following Monday and luckily for me the car was still under warranty because I needed a whole new engine. They gave me a rental car while they found an engine for my car and it took they over a month to get it. Turns out I wasn't the only one with that problem because there was another car with the exact same problem waiting for an engine. A silver 2012 SUV that is perfect for the family & a great first car for a teen. Car broke down last month due to a blown fuse in the alternator and caused so many problems for the coming week. Jump starting didn't work and had to get a tow truck. Comfort is great in the car except some front seat passengers occasionally complain. Other than last month the car has always been pretty reliable and dependable. Except for the key - the battery seems to die so fast like three times in six months and sometimes even the manual insert option in between the seats does not always work. Kia Motor Company (Kia) is recalling certain 2011-2014 Optima, 2012-2014 Sorento and 2011-2013 Sportage vehicles. Machining errors during the engine manufacturing process may cause premature bearing wear within the engine. Bearing wear may result in the engine seizing, increasing the risk of a crash. Kia will notify owners, and dealers will inspect the engine assembly, and replace the engine if necessary, free of charge. The recall is expected to begin May 25, 2017. Owners may contact Kia customer service at 1-800-333-4542. Kia's number for this recall is SC147. Kia Motors America (Kia) is recalling certain 2011-2012 Kia Sportage vehicles. The engine oil pan may leak and, if not addressed, the loss of oil may result in engine damage. A damaged engine can increase the risk of a fire or it can cause an engine stall, increasing the risk of a crash. The remedy for this recall is still under development. Kia will notify owners beginning April 10,2019. Owners may contact Kia customer service at 1-800-333-4542. Kia's number for this recall is SC174.